Krewe of Mid City Parade on Sunday February 18th, 2007 on the traditional St. Charles Ave parade route. Built sometime around 1850, The Royal Street Courtyard Bed & Breakfast is often referred to by locals and tourists alike as the “only real haunted B&B in the New Orleans Faubourg Marigny.” Once inside this stately 150-year-old home you are surrounded by the antique charm of nineteenth-century New Orleans; stately carved columns, trimmed in hand tooled cypress, soar to the 14-foot ceilings, regal Rococo galleries open one upon the other exuding all the elegance of antebellum Louisiana. This stately 150-year-old home is filled with charm, alright, but it also happens to be filled with ghosts: just ask the owners, Phillip Lege and David M. Smith, and they just might be willing to share stories about a recent paranormal encounter. The Royal Street Courtyard B&B has been the site of numerous paranormal investigations over the past several years, but experience has proven that this haunted B&B still has quite a few surprises that continue make believer out of many skeptics. 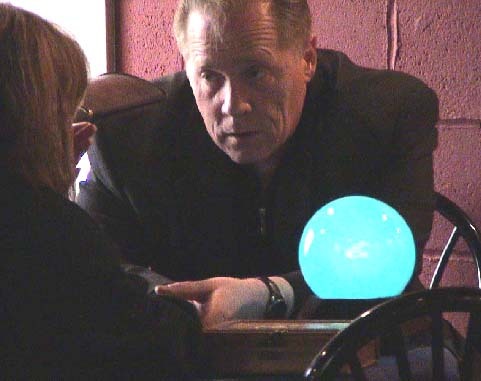 Lege and Smith don't like to say much about the purportedly haunted side of life at Royal Street Courtyard, mostly out of deference to their many clients who are not comfortable with or not interested in the paranormal or unexplained. But the fact remains that there is a very strange atmosphere around the old building and many guests – whether looking for an encounter or not – have left with more than just fond memories of their stay in this Faubourg Marigny landmark. The large building was once a private home and over the generations it has played host to many special events including weddings, Mardi Gras parties and other celebrations. The house has also seen its share of death and tragedy over the years; it has often been the site of funerals, as well. Of course, all this has played a part in shaping its very haunted history. At least once in its lifetime the house was the site of a children’s group home and functioned as the location of a private social club (reportedly a “secret society”) for a time. In the early 1980’s the site functioned as a halfway house for troubled individuals attempting to re-enter mainstream society. From 1985 to 1997 it functioned as “L’Chaim,” a Jewish group home for the mentally ill. Doubtless these numerous incarnations have resulted in the variety of hauntings said to take place within its old walls. MANY OF OUR WEB SITE VISITORS CAN'T UNDERSTAND WHY THEIR PICTURES OF THE HAUNTED ROYAL STREET COURTYARD B&B JUST DON'T COME OUT RIGHT, OTHERS SEND US WHAT THEY THINK ARE THE ROYAL STREET COURTYARD RESIDENT GHOST MR. ANTHONY, CAUGHT ON FILM AND HAVE SENT THEM TO US TO POST AND GIVE OURS AND YOUR EXPERT OPPINONS. The ornate entry door, hand-carved from heavy Louisiana swamp cypress, has been the subject of many photographs over the years and a large majority of these come back with anomalies in them. Guests claim to have seen faces and bodies and even some of the disembodied animals have appeared in the doorway. The sound of ghostly footsteps, disembodied voices, cold spots and cool breezes from nowhere, a gentle tugging on the shirt sleeve, the sound of someone sighing on the staircase or the squeaking of an invisible wheelchair making its way down an empty hallway – these are just some of the experiences reported by visitors who have braved a night or two in the haunted rooms of Royal Street Courtyard B&B. Probably the most often-encountered ghost at the Royal Street Courtyard goes by the name of “Mr. Anthony.” No one knows who he really is but most believe him to be the ghost of a former resident from the 1950’s who became despondent and shot himself in one of the slave quarter apartments. According to Lege and Smith, “Mr. Anthony” will always make his presence felt, usually from the moment a guest arrives. He is said to enjoy cuddling or hugging guests, male and female alike, as a kind of warm welcome. Throughout their stay he might make himself noticed by other means – turning water faucets on in the bedrooms, for instance, or banging about in the kitchen after hours – and Mr. Anthony will always be around to wish guests farewell. He has even firmly patted cab drivers on their backs at curbside! Guests who have been hugged by Mr. Anthony describe it as a “cold chill” enveloping the arms and chest, even on a sweltering New Orleans day. And although Mr. Anthony is never a threatening apparition, guests are never too pleased when he decides to get in bed with them and snuggle a bit. One recent female guest had just such an experience when, in the dead of night, she sensed someone standing beside her bed. Half asleep, she realized someone was getting into bed with her: she felt strong invisible arms around her and the coarse abrasion of a thick beard against her shoulder. That was enough and she jumped from the bed, throwing on the lights. The room was empty – she was completely alone. Sleeping guests are often disturbed by the laughter of ghostly children playing in the hallways outside their rooms. When guests get up and go to the hall to investigate they are met with silence and there is no one in sight. Often in the night there are shrieks and cries that many guests find disturbing. Sometimes there is undecipherable babbling and on one occasion a Tennessee professor visiting New Orleans for an educational conference reported that he listened “for the better part of an hour” as a ghostly voice recited or read aloud in Hebrew – obviously residual hauntings from the building’s days as a Jewish mental home. But the once-human residents are apparently not alone in their preternatural world. Royal Street Courtyard seems to have more than its share of ghost animals haunting the place. There are several ghostly cats that prowl about mingling with the real ones that like to lie on the sunlit porches or lurk about in the bushes. No one can tell just by looking which cats are real and which are phantoms. A small ghostly black dog is often encountered late at night scratching at the doors to be let in or out, or running up and down the empty hallways. This dog has the unnerving habit of disappearing through walls and doors, however! The ghost dog has also been seen in the kitchen, probably looking for handouts just as it did in life! Ghost hunts and investigations have documented at least seven, possibly eight, specific discarnate entities at the Royal Street Courtyard B&B. The ghostly Mr. Anthony is the most prominent, of course, but there are also the phantoms of at least three children – two playmates who like to run around the upstairs hall – and one reclusive and shy dark haired boy who is most often seen standing in the shadows near the foot of the stairs. The ghost of a white-clad nurse is sometimes seen upstairs and is often mistaken for a maid because she is usually carrying fresh white linen over her arms. She will cross in front of guests and disappear through closed doors in the upstairs hall. One entity has been identified in the attic area of the house and this is perhaps the most disturbing energy identified to date. Resounding thudding as of heavy footsteps has been heard throughout the house – even outside the house on at least one occasion – and staff members are reluctant to go to the attics in fear of what is lurking there. Employees have described the being as a “shadow ghost” in the shape of a large man and say that they can always tell when he is about by the icy, graveyard chill that permeates the air. This spirit does not like noise and will usually make his presence known to the upstairs guests when there is too much talking or laughing going on. The owners can only speculate on the identity of the ghost although at least one paranormal investigator has linked the specter to the building’s one-time use as a headquarters for a mysterious secret society. The Dinning area is the haunt of another ghost, possibly a cook who served the building in its institutional days or a one-time owner. This spirit is known to move things and plates about and to hide other cooking utensils; most of its activity is plain mischief. Another possible spirit manifests itself, oddly enough, only during the Mardi Gras season. She is a ghostly old lady who is seen only in the upper windows, wearing a feathered mask, plenty of beads, and nodding in time with the Mardi Gras music. Several people claim to have seen her, although her presence has not been documented. There have been several manifestations of ghostly activity on photographs taken by visitors and staff in the Royal Street Courtyard – that is, when cameras and electrical equipment works at all. Problems with batteries power loss and cameras not functioning are most prevalent in the upstairs area and in the attics. However, many people have caught misty images and orbs in several keepsake photographs. During one investigation a séance was held in one of the guest rooms. A well-known New Orleans spirit medium was in attendance and before long a spirit who identified herself as “Ms. Irma” made her presence known. The bathroom door of the guest room slammed shut and the table being used for the séance began to shake violently; evidently Ms. Irma didn’t like guests staying in her room, disturbing her with their presence. When the window curtains began to stand out on their own as if being held by unseen hands, the guests fled their room in terror. Once downstairs they regained their composure and immediately checked out, asking staff members to retrieve their luggage and personal items from their haunted room. Says Smith, “The fright on their faces said it all! Although I didn’t witness it, something definitely happened to those guests. Unfortunately, it caused them to cut their visit with us short.” Smith says he likes to keep an “open mind” and that staying skeptical keeps his “head on straight” when it comes to dealing with the exploits of his alleged ghostly residents. The beautiful antebellum Royal Street Courtyard Bed and Breakfast is located in one of the most progressive neighborhoods in New Orleans and just a short 15-minute stroll from the history, art and non-stop entertainment of the French Quarter. It is also within walking distance of many popular clubs and restaurants and is just blocks away from Mambo Sallie Ann Glassman’s Island of Salvation Botanica and Rosalie Alley Peristyle. Each Mardi Gras season several popular offbeat parades pass directly in front of the B&B including the notorious Krewe du Vieux, the Court of St. Anne Walking Club, and the infamous Ducks of Dixieland Walking Club. The location is also ideal to experience the festivities of St. Patrick’s Day and the annual Italian-American Society St. Joseph Day Parade. FOR MORE FREE DESKTOP HAUNTED WALLPAPER BACKGROUNDS VISIT HERE. Six blocks due east from the French Quarter on Royal Street. 14 days during non-peak season. 60 days during Peak season: Sugar Bowl, Mardi Gras, French Quarter Festival, Jazz Festival, Essencefest, Southern Decadence, Halloween & New Years. A $25.00 cancellation fee will be retained. We welcome unsolicited ghost photos. Let us help your web site be the most... Advertise now with “Haunted America Tours” Haunted destination!